On a small farm in Maine, there lives a chicken named Penelope. She’s just a plain white hen who doesn’t feel very special. Surrounded by a bibliophilic dog, some film-making young chickens, and a peacock who likes to play epic games of hide-and-seek with the sheep, she just doesn’t seem to stand out. Feeling sad and alone, Penelope decides to try and change her lot through the only asset she thinks she has: her eggs. 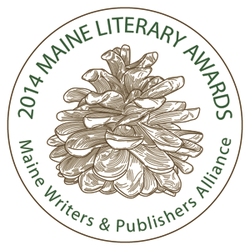 MAINE WRITERS & PUBLISHERS 2014 MAINE LITERARY AWARDS. by Kelly Ellerbrook Hardcover 68 pages 8.5 x 11 Finalist in 2014 Maine Literary Awards. Kelly Ellerbrook was born and raised in Maine. Growing up she enjoyed visits to her aunt and uncle's farm. She especially enjoyed petting the fuzzy sheep, gathering eggs in the hen house, and watching the chickens untie her shoelaces (they thought the laces were worms, you see). Having lived for many years in both California and Indiana, Kelly has recently made the move back to Maine where she now lives with her husband and their orange cat. The Perfect Christmas Egg is her first book.